Composed by Yoel Epstein. Method, Repertoire, Classroom, General Instructional, Technique Training. Score, Set of Parts. 24 pages. Published by Yoel Epstein (S0.75563). 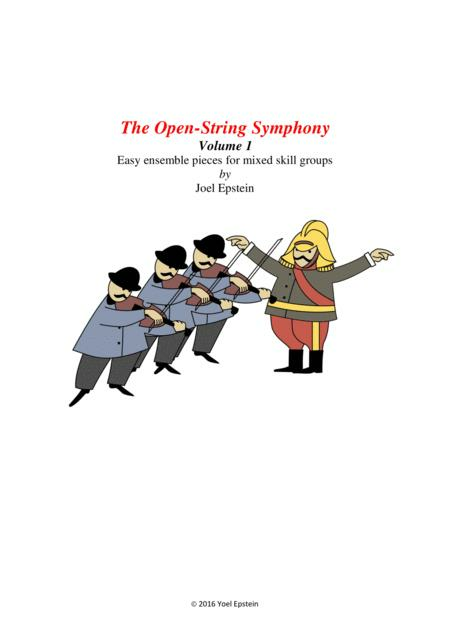 This volume contains four pieces for beginning string ensemble. They can be played in any combination – as duet or trio, as quartet, or as string orchestra. The student parts are all on open strings. Two of them – the Ode to Joy and Pop Goes the Weasel – have melodic lines that can be played by an advanced student or another instrument (I teach in a Waldorf school, so the open strings accompany a recorder ensemble). This is volume 1 of two volumes (so far). You can buy the second volume here. If you send me your email to yoelepst@gmail.com, I will send you new versions of this volume free of charge. Also, if you want to make changes to suit your special needs, send me an email and I will send you the source files for the pieces in Musescore format (a free and excellent music editing program) or in Music xml, which you can use with Sibelius, Finale, or virtually any other music editing program. If you enjoy this, you are welcome to try some of my other arrangements. You can see them by clicking here ), In particular, you might be interested in my music flash cards ( here). If you need arrangements of any of these songs for special combinations of instruments, feel free to contact me, and I will try to accommodate. Write me at yoelepst@gmail.com. Hope you enjoy.